The average CPI of the above is 6505 and accordingly the number of DA slabs are 516(6505-4440= 2065/4= 516 Slabs) The last quarterly Payment of DA was at 478 Slabs. 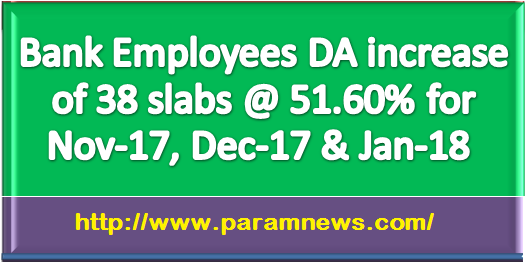 Hence there is an increase in DA slabs of 38, i.e 516 Slabs for payment of DA for the quarter Nov, Dec 2017 and January 2018. In terms of clause 7 of the 10th Bipartite Settlement dated 25.05.2015 and clause 3 of the Joint Note dated 25.05.2015, the rate of Dearness Allowance payable to workmen and officer employees for the months of Nov, Dec 2017 & January 2018 shall be 51.60 % of ‘pay’. While arriving at dearness allowance payable, decimals from third place may please be ignored. We advise banks to pay the difference between the old and revised salary and allowance to officers on an adhoc basis, pending amendments to Officers’ Service Regulations.